I like a good kitchen knife as much as the next person and I’m quite possessive about my favourites. I even asked Santa for a butcher’s saw the Christmas before last. But I wouldn’t necessarily describe myself as a knife nerd. My husband, on the other hand, has always had a worrying affinity for sharp pointy things. He collected bayonets when he was a boy. When they started getting too expensive he moved onto truncheons, so perhaps I should amend that to ‘sharp pointy things and bludgeons’. Believe me when I say Robert is the kindest and gentlest of men. His interest is aesthetic, not psychotic. Maybe it’s a man thing, like sheds. He has a lot of sheds. But when I was trying to find him the perfect birthday present I didn’t go to B&Q. I went to Sergio Muelle. 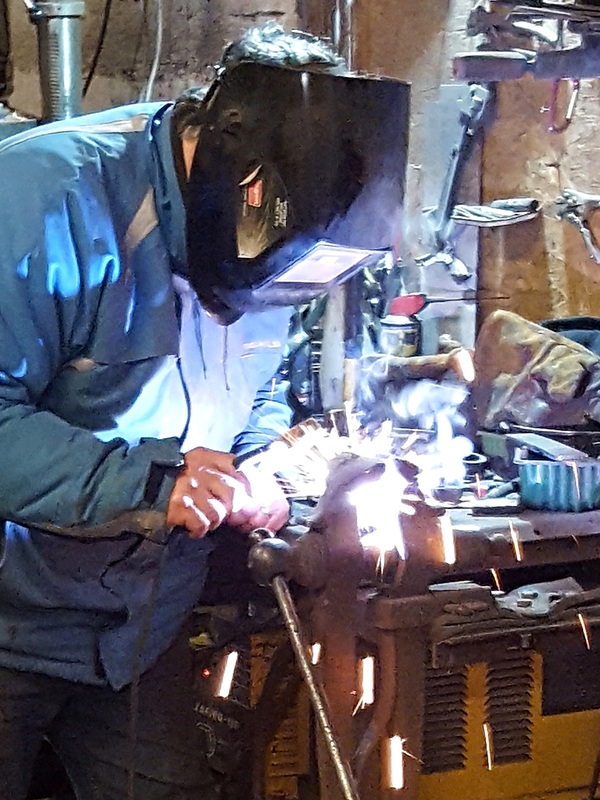 Born in Peru, Sergio spent a number of years in Spain before ending up in Newmarket working as a farrier for some of the world’s top racing trainers. It is a physically demanding job and eventually, on doctor’s orders, he had to give up the work he loved. By then he was married to a Suffolk farmer’s daughter and doing his own butchery on the animals they reared for their table. But he got exasperated with the quality of the knives he was using, started making his own, put a few pictures on Facebook and before you could say ‘damascus steel blade with a mulberry wood handle and bog oak ferrule’ he found himself at the helm of a new business, Twisted Horseshoe Knives. Sergio’s knives are beautiful: hand-crafted, using what in cookery terms we’d call locally sourced ingredients. 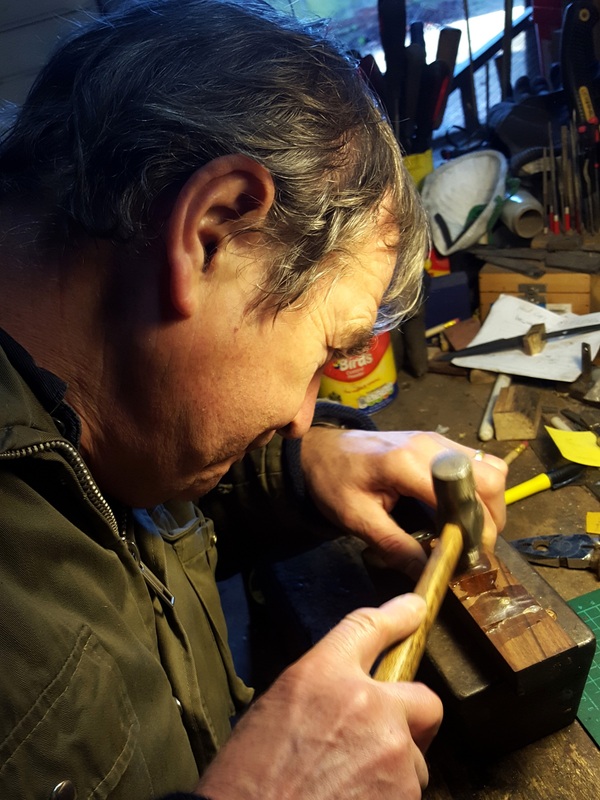 Wood from his Suffolk orchard, ancient bog oak from Norfolk, steel from old farrier’s rasps, brass taps, tiny fragments of Anglo-Saxon bronze found in East Anglian fields, they can all get thrown into the mix. In addition to making knifes for the kitchen and the field, he runs one-day knife-making courses and it was one of these I bought as a birthday present for Robert. I dropped him off at Sergio’s barn and disappeared to take the cat to the vet. I should have known better than to leave the two of them alone. 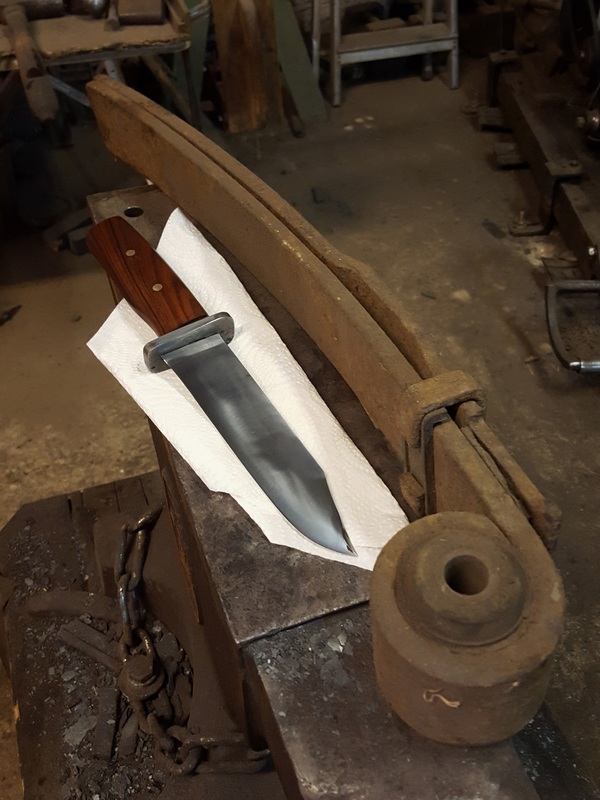 When I returned, expecting a gleaming new addition to the kitchen knife rack, I found instead that Robert was busy making a Bowie knife. ‘But what is it FOR?’ I wailed. ‘Sharpening sticks,’ he said proudly. Did I mention that he’s the gardener of the family? I know, I didn’t get it either. But he was happy and that, really, was (ha!) the point of the exercise. Obviously, there are some parts of the process that for safety reasons Sergio carries out himself. 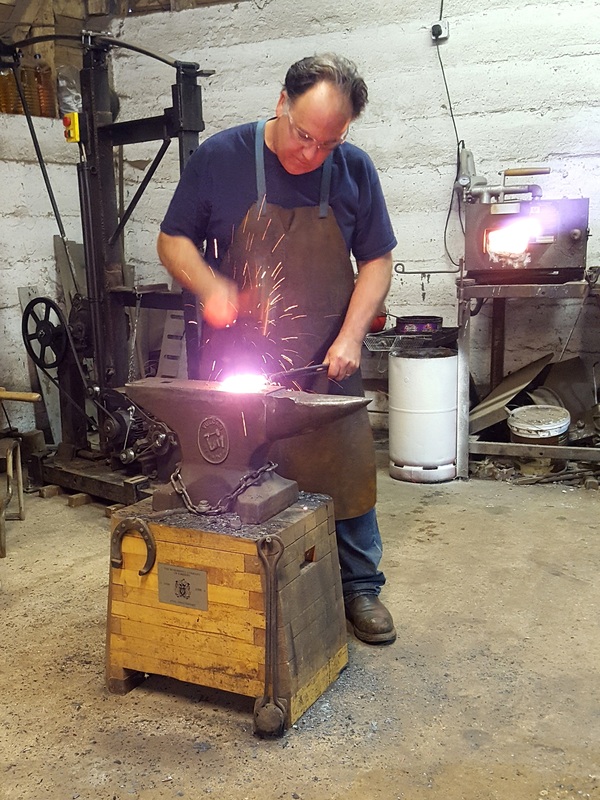 But he works with his pupils every step of the way, from the first drawing to the finished article, forging, beating, quenching, annealing, grinding and polishing, so that at the end of the day they can really say it’s their own knife. Robert’s knife is, in fact, a beautiful thing. Sergio is more of an alchemist than a smith. 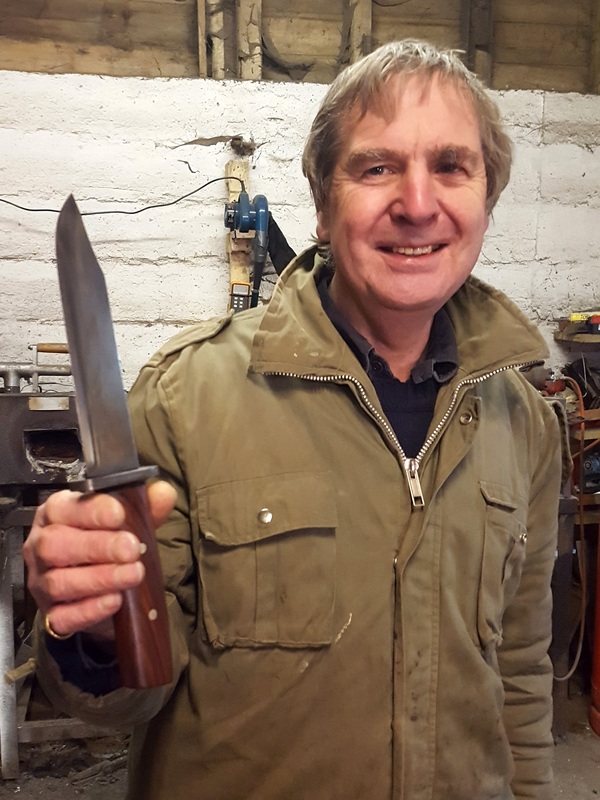 He takes what are often the most unprepossessing objects … in this case a leaf spring from an old Ford Transit … and forges them into something new and extraordinary like this knife blade. The handle is bobinga, a type of rosewood, the guard is Damascus steel, the spacer buffalo horn (something Jim Bowie could have got behind) and the whole thing is perfectly balanced and weighted. Like all good knives, it sits well in your hand. And Robert’s face at the end of the day really said it all. Happy birthday, you knife nerd. This entry was posted in Gadgets and gizmos, Producers and tagged artisan knives, knife making courses, sergio muelle, suffolk crafts, twisted horseshoe knives by Linda Duffin. Bookmark the permalink. It was made for him, Cindy! What an excellent present, and a great example of recycling. And fantastic craftsmanship too, something I know you’ll appreciate. What an excellent idea for a gift. When it comes to buying presents we all seem to have so much ‘stuff’ so I love the idea of learning a new skill and making something. That’s a truly wonderful story of a wonderful craftsman. A special present indeed. Well done. I wish my wife would get me a gift like that for my birthday. Thanks for sharing, your husband’s knife came out great. You just need to drop a great big hint! Thanks, I’m glad you liked it. Haha, you need to talk to Sergio! He’s The Man.